The Anti-Defamation League (ADL) fights anti-Semitism and all forms of bigotry and works to secure justice and fair treatment for all. Go! Calendars is proud to be a partner with ADL Austin on its Community of Respect initiative. 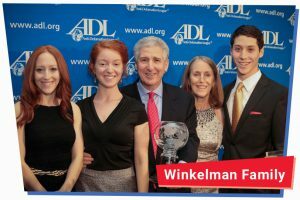 In March 2012, Marc Winkelman and his family were honored with the Raymond and Audrey Maislin Humanitarian Award. The Boys & Girls Clubs of the Austin Area was founded in 1967. Today, there are 15 clubs throughout the Austin area that serve students from elementary school to high school, ages 6-18. Functioning as an after school program, the Boys and Girls Clubs of the Austin Area (BGCAA) has several nationally recognized programs that address pressing issues for youth today. These programs cover the following core curriculum areas: character and leadership, education and career, health and life skills, arts, sports and fitness, and several special initiatives. In addition to financial support for its initiatives, Go! Retail Group, through its vendor relationships, donates games, toys and puzzles to Boys and Girls Club facilities throughout the Central Texas region. Big Brothers Big Sisters provides children facing adversity with strong and enduring, professionally supported one-to-one relationships that change their lives for the better, forever. Go! Retail Group is proud to support the efforts of Big Brothers Big Sisters through annual financial contributions. In 2005, Turk and Christy Pipkin founded The Nobelity Project, an education and action nonprofit, to make movies that make a difference. The Nobelity Project collaborates with Nobel laureates and other inspiring leaders to make enlightening and motivating films that bring people awareness and move them to action. The Nobelity In Schools program works with teachers nationwide engaging students with the issues that will affect their futures. And the Kenya Schools Fund is building classrooms, libraries, computer labs and clean water systems across rural Kenya, including Mahiga Hope High School-the only secondary school in that region. On film, online, and in schools, The Nobelity Project is a place to explore global issues and discover ways to effect positive change. LIVESTRONG supports survivors and their families through patient navigation services, by conducting survivorship research, by advocating for funding and policies that propel the fight against cancer, and by leading awareness campaigns to dispel the stigma and misconceptions about the disease. Go! Retail Group is proud to support the efforts of LIVESTRONG through annual financial contributions. St. David’s Foundation invests in a healthy community through funding, hard work, and initiatives to better care for the underserved and uninsured. As a joint owner of St. David’s HealthCare, the Foundation achieves its goals by investing the proceeds from the hospitals back in the Central Texas community. In 2012, St. David’s Foundation plans to give more than $34 million to the community through grants to numerous agencies, local safety net clinics, and the highly acclaimed St. David’s Dental Program. Go! Retail Group supports the mission of the St. David’s Foundation with a combination of monetary donations and the volunteer efforts of our CEO Marc Winkelman. Marc serves on the Board of the St. David’s Foundation. The YMCA of Austin is focused on strengthening the community through youth development, healthy living, and social responsibility. Go! Retail Group has been a major supporter since 2005, when Paul Hoffman joined the board. In addition to our annual financial support of the Y’s many worthy programs, Go! Retail Group’s game and toy vendors donate all the presents for the YMCA’s annual Children’s Christmas Party, which provides a Christmas experience for more than 2,000 local kids each December, many of whom would otherwise have no Christmas at all.